The 2005 Atlantic hurricane season was the time from June 1 to November 30, 2005 when hurricanes officially formed in the Atlantic Ocean. Storms sometimes form before and after these dates but most storms form during the season. Tropical Storm Zeta formed on December 30 and dissipated on January 6, which is after the November 30 end of the season. 2005 broke many records set. There were 28 storms that were tropical storms and 15 that became hurricanes. For the first time ever storms were named by the Greek alphabet as the normal name list had been used up. The storm which caused the most damage was Hurricane Katrina, which hit New Orleans, USA, and killed over 1000 people. The strongest storm of the season was not Katrina, it was Hurricane Wilma. Wilma was the strongest hurricane ever in the Atlantic Ocean, reaching a record low pressure of 882 mbar. Arlene, the first storm of the season, formed near Honduras on June 8 and moved north. It came close to western Cuba on June 10 before entering the Gulf of Mexico. Arlene strengthened just below hurricane strength before making landfall on western Florida. The storm quickly weakened while moving inland, and later became an extratropical remnant on June 13. Tropical Storm Bret was a weak tropical storm that formed as Tropical Depression Two in the western Gulf of Mexico, then quickly became Tropical Storm Bret. The storm made landfall in Tuxpan, Veracruz, Mexico the next morning. It dissipated on June 30. The storm cause 2 deaths and $9 million in damage. Hurricane Cindy was a tropical cyclone that reached minimal hurricane strength for a very short time in the Gulf of Mexico during July and made landfall in Louisiana. It was the third named storm and first hurricane of the 2005 Atlantic hurricane season. Hurricane Cindy left 3 deaths and $320 million in damage. Hurricane Dennis was very powerful hurricane that reached a peak of 150 mph. Hurricane Dennis moved mostly northwestward in its track. It made landfall in Grenada, and almost made landfall in Jamaica, and also made landfall in Cuba, and Florida (United States). Hurricane Emily was the strongest and only known category 5 hurricane in July. It beat a record in strength set by Hurricane Dennis only 6 day before. Hurricane Emily was one of four category 5 hurricanes in 2005. Hurricane Emily caused about 17 deaths and $1.014 billion in damage. Tropical Storm Franklin formed north of the Bahamas on July 21 and moved steadily across the western Atlantic while coming close to Bermuda on July 26. Later, Franklin became an extratropical cyclone near Newfoundland, before being absorbed by another non-tropical system. Franklin caused no damages and killed no people while it stayed in the ocean during most of its life. Tropical Storm Gert was a weak and short lived storm. Tropical Storm Gert formed in the Bay of Campeche on July 23. The storm made landfall in Mexico and dissipated on July 25. Tropical Storm Harvey was a strong tropical storm that moved across the Atlantic Ocean from August 2 to August 8. Harvey caused no damages or deaths and was the eighth named storm of the 2005 Atlantic hurricane season. Tropical Storm Harvey only affected Bermuda. Hurricane Irene was a rather long lived storm (about 2 weeks). It took it a while to become a hurricane. The only effects from Irene were large waves. Irene caused no damage or deaths. Tropical Storm Jose was a strong but very short lived storm. It quickly formed in the Bay of Campeche and made landfall in Mexico. Tropical Storm Jose dissipated the next day. Tropical Storm Jose caused 8 deaths and $45 million in damages. $125 billion in damage and 1,836 dead. Tropical Storm Lee formed east of the Lesser Antilles as a tropical depression on August 28. On the next day, the depression weakened into a tropical low. The low then moved north and became stronger. It became a tropical storm for a short time on August 31. Lee quickly weakened again into a remnant low and was absorbed by a cold front on September 2. Hurricane Maria was a major hurricane in September 2005. This storm was rare because it affected New Jersey, Iceland, Scotland, and Norway. Hurricane Maria caused 3 deaths and $3.1 million in damage. Nate was a category 1 hurricane. Hurricane Nate also helped Hurricane Maria kill one person in Bermuda, and another in New Jersey. Hurricane Ophelia was a category 1 hurricane in September of 2005. It moved strangely just offshore of the United States. In all, Ophelia killed 3 people and caused $70 million in damage, mostly to North Carolina. Hurricane Philippe was a category 1 hurricane that moved near land, but did not affect land. This was the third of five uses of a "P" name. The other were Pablo, Peter, Paloma, and Paula. Hurricane Rita was a powerful category 5 hurricane that started east of the Bahamas on September 26. It moved south of Florida and into the Gulf of Mexico. Rita became a category 5 hurricane very fast, then made landfall. Hurricane Rita made landfall as a category 3 hurricane in Louisiana, on September 24. By September 26, Rita had died over the U.S. The hurricane killed about 120 people and caused $10 billion in damage. This was only the second time that an "R" name was used in the Atlantic, the other was Roxanne. Hurricane Stan was the sixth of the seven storms in 2005 to make landfall in Mexico. The storm caused $1 billion in Mexico and the Central American region. The exact number of people killed is unknown, but the guess is around 1,660, though it could be up to 2,000. Tammy was a tropical storm that only existed for a total of two days and brought minor damages to the southeastern United States. It peaked with 50 mph (85 km/h) just before making landfall on the northern Florida coast. Tammy formed from a strong non-tropical low on October 5 just off the Floridan coast. It moved north, peaking with 50 mph (85 km/h) winds just before making landfall on Atlantic Beach, Florida on October 6. Tammy died shortly later. Most of the damages were losses from FEMA that totaled up to $30 million. Tammy also killed 10 people. This was only the second time that a name starting with the letter "T" in the Atlantic Ocean. The other use was from Hurricane Tanya in 1995. Hurricane Vince was a very rare and unusual hurricane. Hurricane Vince formed in the Atlantic, in a location where the water was too cold for a storm to form. It was only a hurricane for about 6 hours. The storm performed another rare feat, which was making landfall in Spain. This was the first time that a "V" name had been used in the Atlantic. Hurricane Wilma was the strongest hurricane ever recorded in the Atlantic Ocean. Hurricane Wilma lasted as a storm from mid to later October in 2005. Wilma left $28.8 billion in damage, mostly to Florida and the Yucatán Peninsula. Tropical Storm Alpha was the first tropical storm to get a Greek alphabet name. It caused 43 people to die over Haiti, Dominican Republic, and the Bahamas. All of this happened before Hurricane Wilma absorbed Alpha on October 24. Hurricane Beta was a category 3 hurricane in late October, 2005. It strengthened fast and made landfall in Nicaragua, before it died on October 31. Beta caused about 4 deaths and $3 million in damage. Gamma was a tropical storm that started in the middle of November. It crossed the Caribbean Sea and dissipated during this time. Tropical Storm Gamma reformed north of Honduras, before it again died. The tropical storm killed about 41 people in Honduras. Tropical Storm Delta was a strong tropical storm. It killed at least 7 people in the Canary Islands and caused about $360 million in damage. The remains were last seen over Morocco. Epsilon was a rare December hurricane, the first since Hurricane Lili in 1984. Forecasters incorrectly guessed on how much time it would take for Epsilon to dissipate. Epsilon did not come anywhere near land. Tropical Storm Zeta was the last storm of 2005. The storm formed on December 30 over cold waters in the Atlantic. Tropical Storm Zeta dissipated on January 6, 2006. It was only one of two storms to live in two different years (the other was Hurricane Alice, which was in 1954 and 1955). The storm did not affect land or cause any deaths or damage. 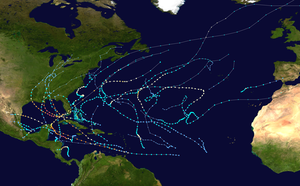 There were also four storms in and around the 2005 Atlantic hurricane season that were not given any names: Tropical Depression Ten(10), Tropical Depression Nineteen(19), Subtropical Depression Twenty-two(22), and a subtropical storm that was not found until after it had happened. A subtropical cyclone is a storm that is not quite a tropical cyclone, but is more tropical than an extratropical cyclone. In the spring of 2006, Hurricane Dennis, Hurricane Katrina, Hurricane Rita, Hurricane Stan, and Hurricane Wilma were retired for the damages they caused, and were replaced by Don, Katia, Rina, Sean and Whitney for 2011. This page was last changed on 15 October 2018, at 14:54.